The son of Equatorial Guinea's dictator of 30 years commissioned plans to build a superyacht costing $380 million, nearly three times what the country spends on health and education each year, says a corruption watchdog. Global Witness has been urging Washington to institute sanctions against Teodorin Obiang, whose extravagant lifestyle currently includes a $35 million-dollar mansion in Malibu, California, a $33 million jet and a fleet of luxury cars, while earning a salary of $6, 799 a month as agriculture minister. The government press office in Equatorial Guinea confirmed that the president's son had ordered the yacht design, but said he "then dismissed the idea of buying it". It said that if the order had gone ahead, he would have bought it with income from private business activities and not "with funds derived from sources of illegal financing or corruption". President Teodoro Obiang, who reportedly is grooming his son to succeed him as president, took power in a bloody 1979 coup. Forbes magazine has estimated his wealth at around $600 million. Teodorin Obiang justified his wealth in a sworn affidavit to a South African court questioning his ownership of luxury mansions and expensive cars in Cape Town in 2006. He stated that public officials in his country are allowed to partner with foreign companies bidding for government contracts and said this means "a Cabinet minister ends up with a sizable part of the contract price in his bank account". A U.S. Justice Department investigation into U.S. banks accepting some $75 million from Teodorin Obiang said in a 2007 report that "it is suspected that a large portion of Teodoro Nguema Obiang's assets have originated from extortion, theft of public funds, or other corrupt conduct". No action has been taken to sanction Obiang's son, despite pressure from groups including U.S.-based Equatorial Guinea Justice. "To stop the type of large-scale theft of assets and corruption carried out by high-level government officials, that continues to make poverty eradication in African an unattainable goal we need the full co-operation of Western nations that provide the goods and services demanded by these corrupt millionaires," said the group's executive director Tutu Alicante. The tiny West African nation may be oil rich, but U.N. statistics show that 20 percent of children in Equatorial Guinea die before reaching the age of five, and the average citizen is unlikely to live beyond 50. The State Department report on human rights also has condemned killings by security forces and the torture of prisoners. Meanwhile, writer Juan Tomas Avila Laurel is in the 17th day of a hunger strike demanding justice for the people of Equatorial Guinea, inspired by the popular revolutions that have ousted longtime leaders of Egypt and Tunisia and now threaten Libya's Moammar Gaddafi. Avila Laurel, 44, left Malabo for Barcelona, Spain, amid fears for his safety the day he began his hunger strike on February 11. He joins one-third of the population living in voluntary or enforced exile, according to the U.S. State Department. The government has reacted to the author's hunger strike by denouncing "the web of gossip, lies and miserable maneuvers" surrounding reports about Equatorial Guinea. 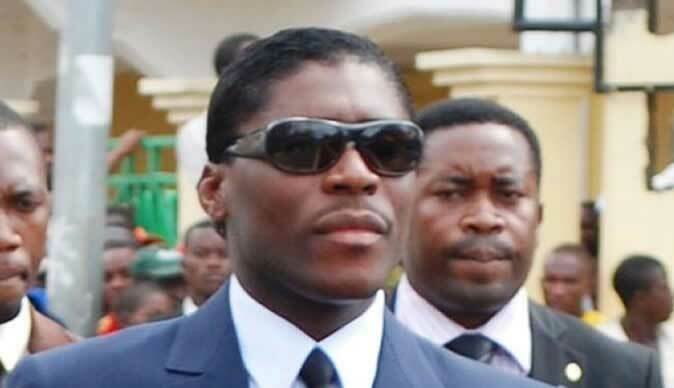 "Nonetheless, we hope this person's example also serves to silence many mouths who continuously speak of lack of freedom and respect for human rights in Equatorial Guinea since, as is more than evident, this person has acted at all times with absolute freedom," it said in a statement on its website.